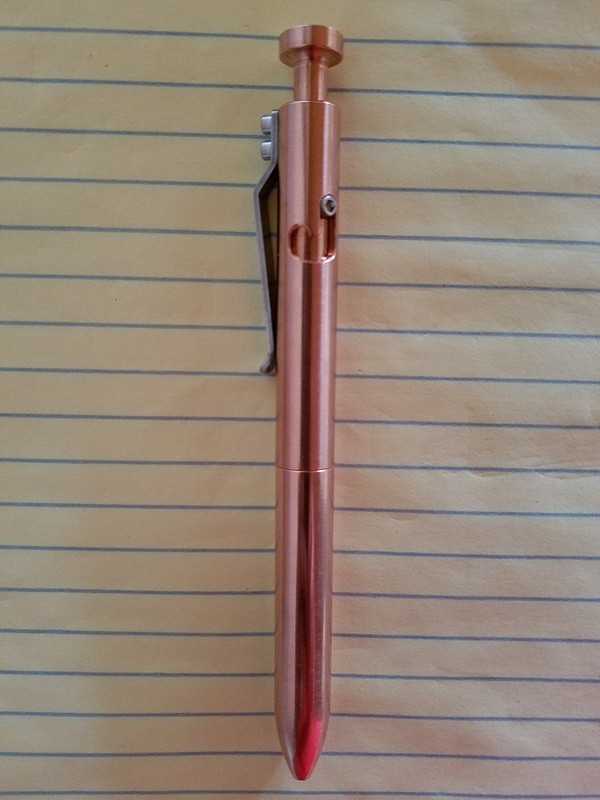 The pen is 5.6" long. This is the same length as my Tactile Turn Glider, which is also made from tellurium copper. However, the Bolt is heavier than the Glider, with the Bolt weighing 2.79 oz. on my digital scale, and the Glider 2.22 oz. Also, while the Bolt uses Schmidt 9000 refills, the Glider uses Pilot G2 refills. Here are the Glider and Bolt side-by-side. The Glider is showing some natural darkening. The machined finish on the Bolt is more polished and smoother than on the Glider, and lacks the texture lines of the Glider. However, it is not highly polished, and the fine machine marks left on it give the Bolt an attractive, functional, industrial look. From my limited use so far, I haven't found gripping the Bolt to be a problem. This could change with prolonged use, particularly given the weight of the Bolt. Only time will tell and I'm looking forward to using the pen and developing some conclusions about it. 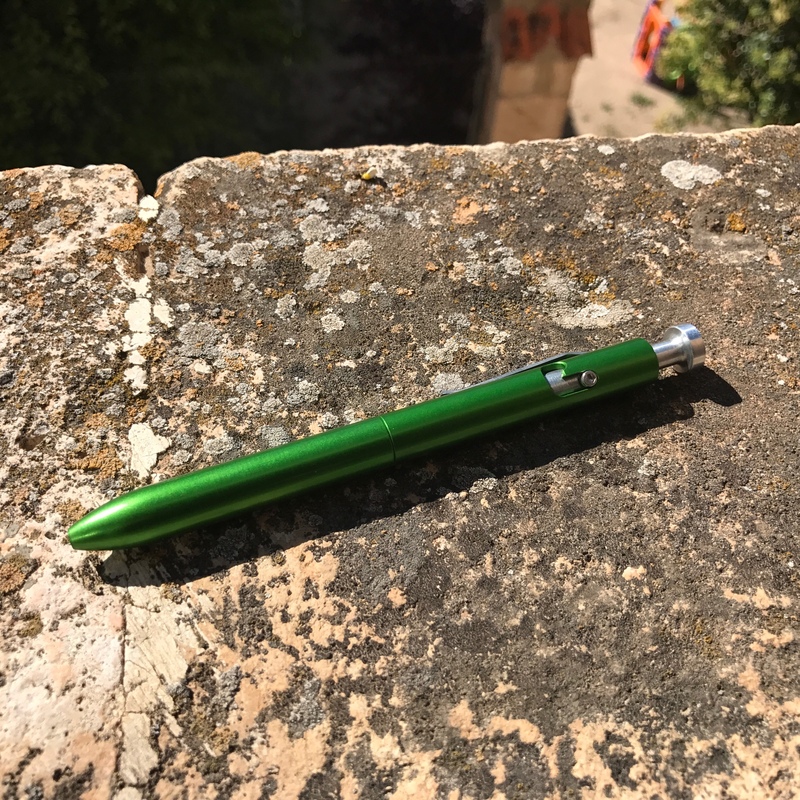 Right now, I'm very happy with this new toy, which is definitely in the category of a fine writing instrment. 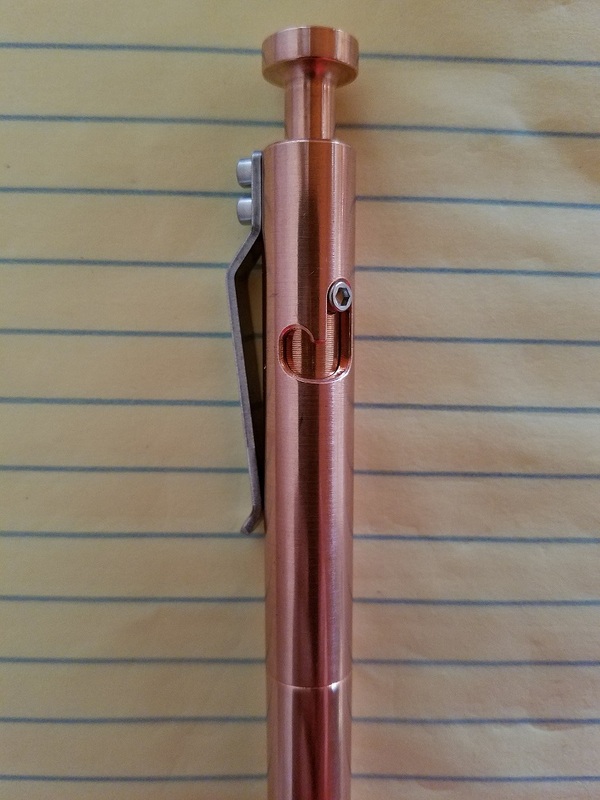 Karas Customs makes other fine pens and if you own one, feel free to post pictures in this thread. 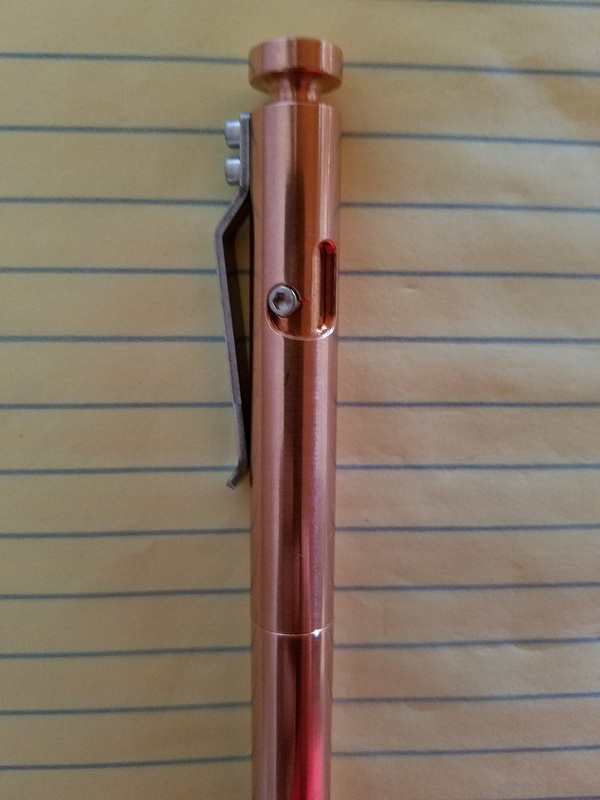 I got one of these pens last year. Ricardo, congrats on your beautiful Father's Day gift! 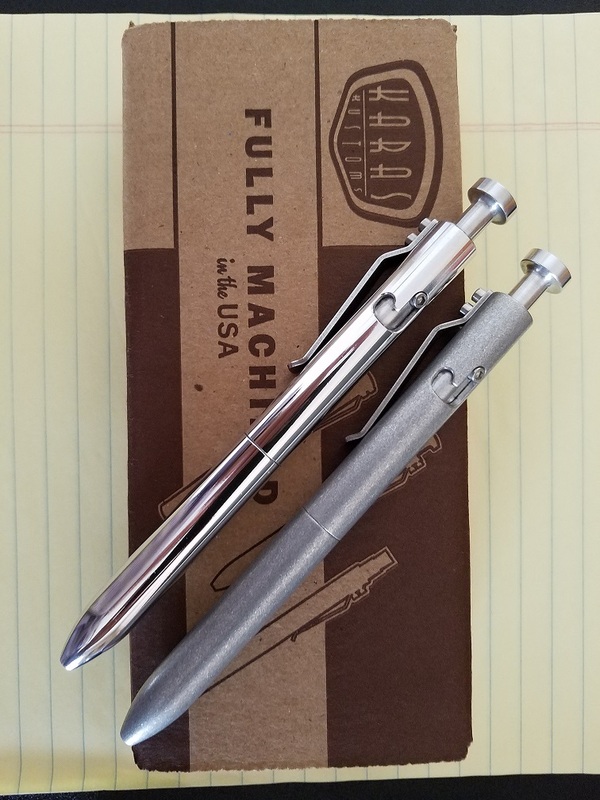 I recently got a Karas Bolt in tumbled aluminum. 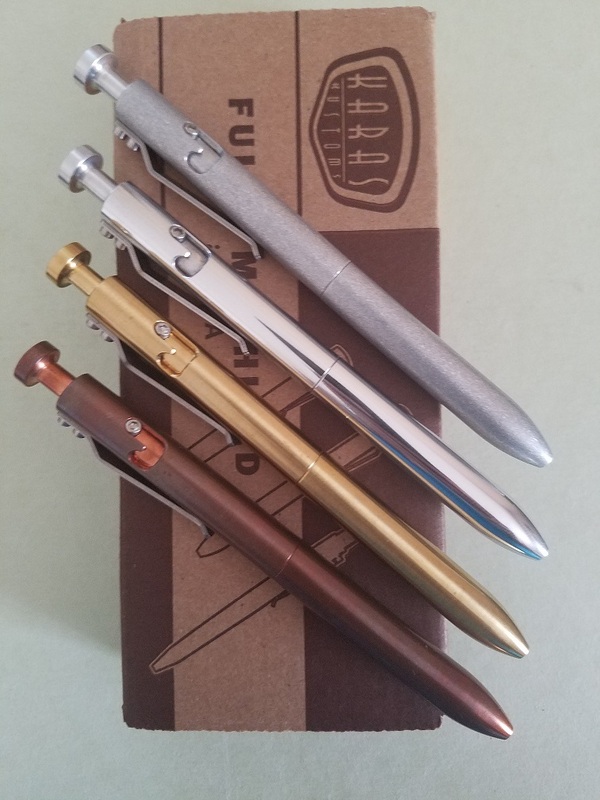 Karas and Tactile Turn certainly offer some fine pens! 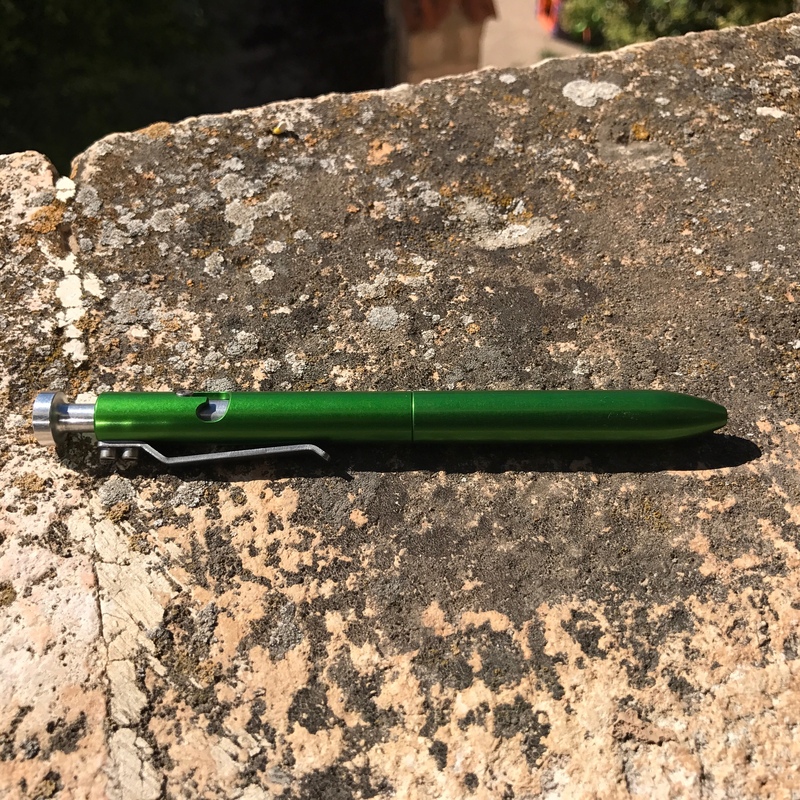 Just bought a Green Bolt Aluminium. Billy and Jose, your Bolts are definitely sharp. The aluminum ones are very light, and I'm sure I'll be adding one in that material. Gonna have to order one of these. Love my Tactile Turn, but want one to keep at the office. (06-18-2017, 03:32 PM)Red One Wrote: Gonna have to order one of these. Love my Tactile Turn, but want one to keep at the office. Jim, if you love your Tactile Turn you'll probably appreciate the Bolt also. Very nice Jose. I knew you had ordered one, and I'm glad you posted pictures when it arrived. I'm waiting on a raw aluminum Bolt, which should get to me in two days. 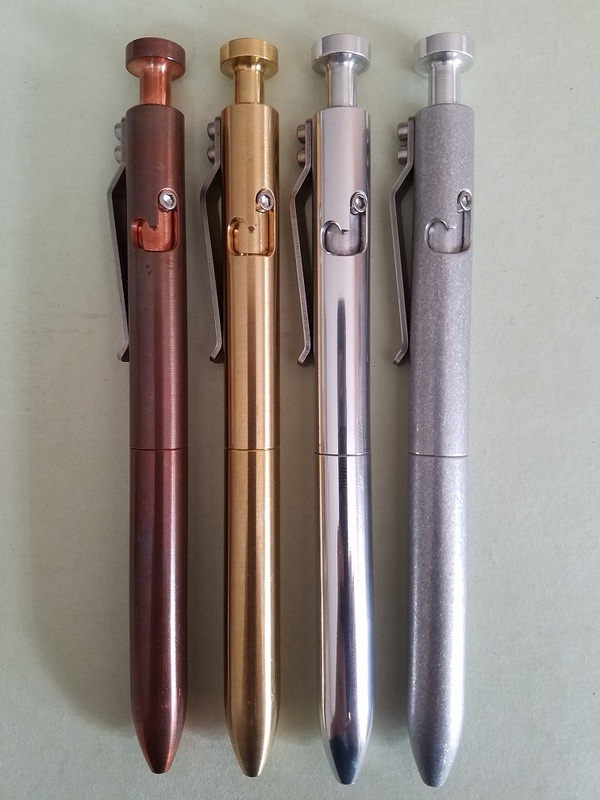 The anodized ones are indeed beautiful, but there are so many great colors available that it's hard to make a choice. Thanks you Ricardo. Yes, i want all! Yes Jose, I can definitely see wanting all the colors! I do find the olive green particularly nice. 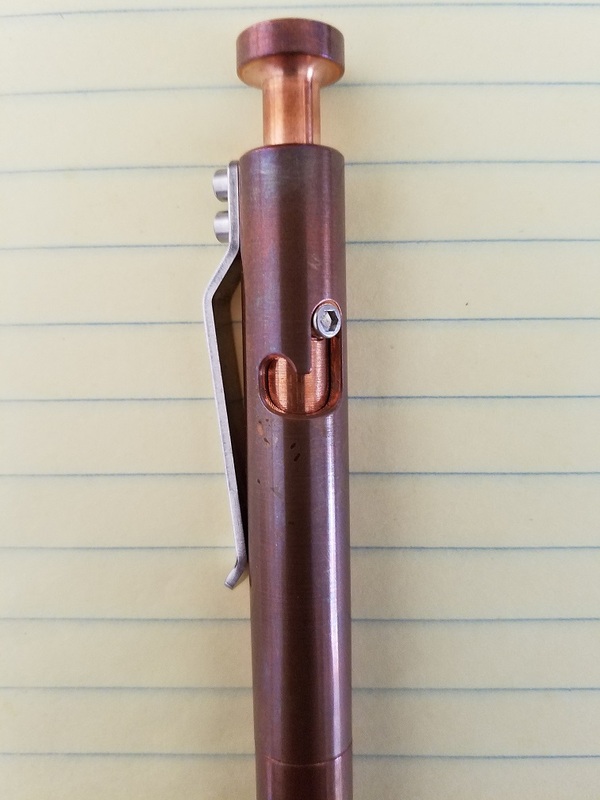 My copper Bolt has developed some nice patina after about one month. I don't intend to polish it. 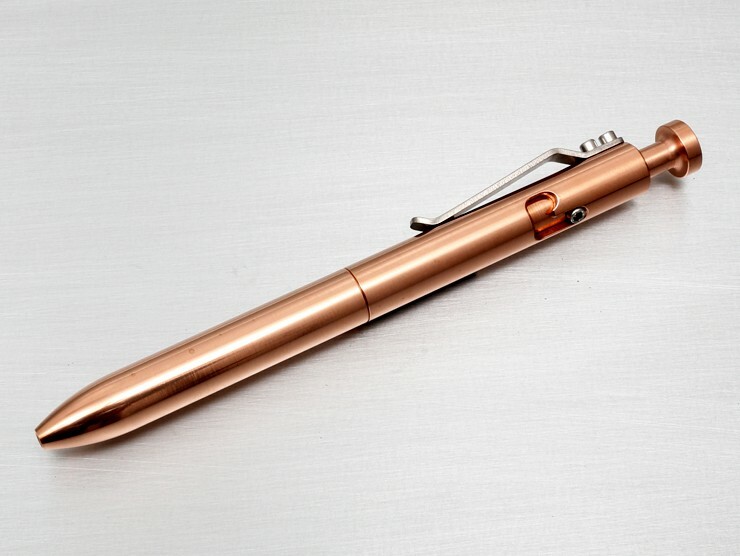 The copper Bolt is heavy, so it's best as a desk pen rather than for carrying on your person on in a briefcase. 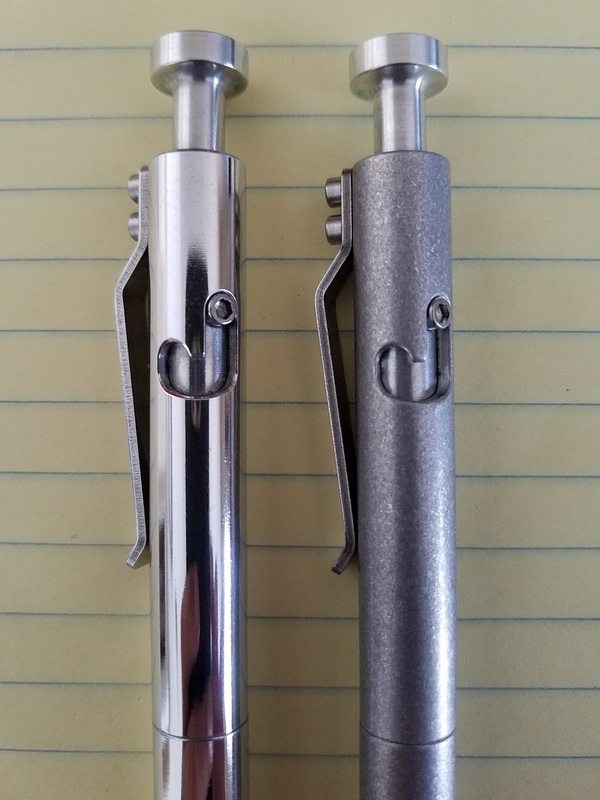 I wanted a lighter Bolt, but could not decide between the raw aluminum and the tumbled raw aluminum. The simple solution was to try both. 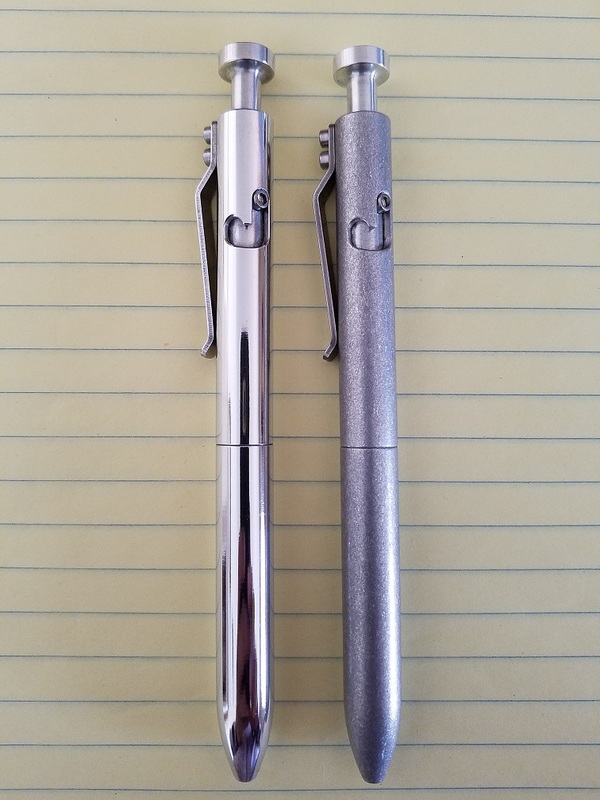 The raw aluminum is polished. It is not highly polished, as some light machine marks are evident. 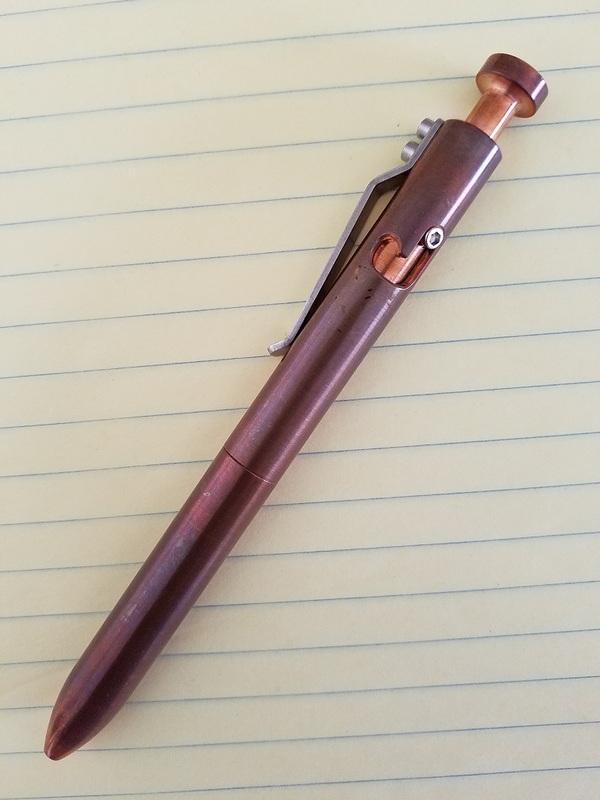 However, it's fine for a working pen. When it first arrived, it was not as shiny as in the pictures. A small amount of Maas Metal Polish on a soft cloth quickly brought out the shine. 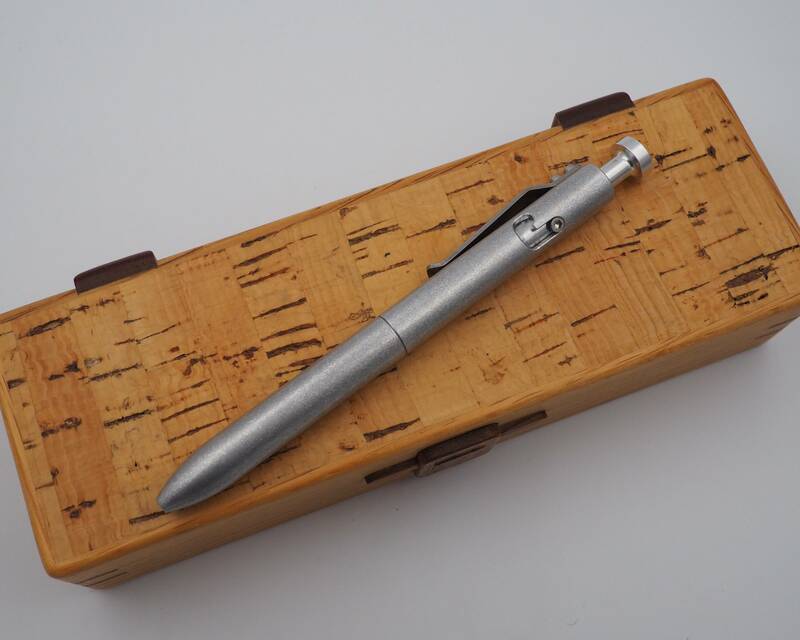 Aluminum is a soft metal which scratches easily, so the tumbled raw aluminum Bolt will wear better in the long run. That patina is wonderful Ricardo. My fave aluminum is the raw tumbled. 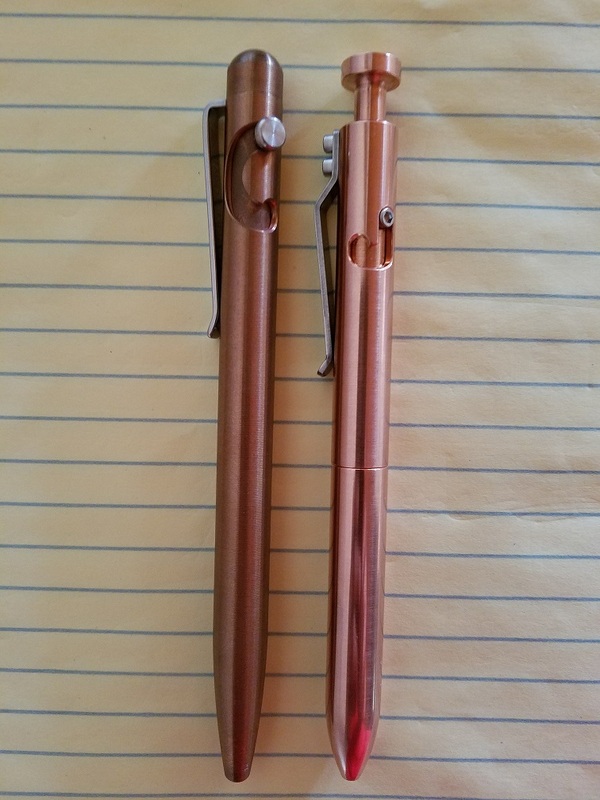 I now have the Karas Bolt in each of the metals they offer - copper, brass, raw aluminum, and raw tumbled aluminum. 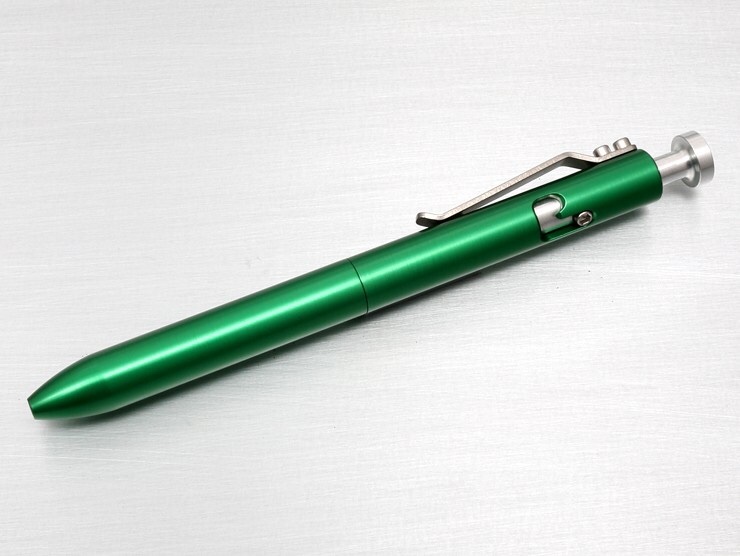 The aluminum is also offered anodized in various great colors, but I'm not going there. My collection of Karas Bolts is complete.